I’d really like to find an answer that’s more interesting than “education” here. And maybe I will. I’m toying around with the idea that we’re in a weird interregnum period in which a lot of other countries have become rich and educated enough for their workers to compete with our workers but not quite rich and educated enough for their workers to begin buying things from our workers, and that this’ll largely sort itself out as time goes on. I don’t think Ezra’s last paragraph will bear much fruit- these forces of globalization seem unlikely to equilibrate. Regarding his fallback of education, I think most of my rebuttal comes in my post from last night, which of course is completely ripped off of Larry Mishel’s excellent work. The important fact, though, is that profits have been doing just fine- yes, they fell during the crisis, but they have soared in the recovery. Profits show that businesses can choose to pay better; however, because labor is weak, they don’t, and because their political power is strong, they have to give back relatively less in corporate taxes. The power gap is the reason why businesses can afford to pay better wages, and create more jobs, but choose not to. The power gap will not go away on its own, but will only accelerate without a political movement to restructure our economy. The huge increase in wage and income inequality experienced over the last 30 years is not a reflection of a shortfall in the skills and education of the workforce. Rather, workers face a wage deficit, not a skills deficit. This argument implies that unemployment difficulties reside in the workers who are unemployed: they either are located in the wrong place or do not have the required skills for the currently available jobs. If this is so, then macroeconomic tools such as fiscal policy (spending or tax cuts) or monetary policy cannot address our unemployment or long-term unemployment situation. But surprisingly, perhaps amazingly, there is no systematic empirical evidence for such assertions. Together, these trends suggest that the forthcoming supply of college graduates is meeting the growing demands of employers for such workers. Moreover, these trends suggest that a rapid expansion of the supply of college graduates will cause the wages of college graduates to decline, assuming that the productivity–pay gap continues unabated. It is not the economy that has limited or will limit strong income growth, but rather the economic policies pursued and the distribution of economic and political power that are the limiting factors. Education is a favored response to inequality and unemployment for many mainstream economists of all stripes. Its proponents are then able to say that by favoring equal education, they favor equal opportunity. However, a class lens shows that this leveling does not actually happen. Rather, a relatively powerful and small group of people will continue to capture societal surplus, while wages for everyone else will stagnate relative to what they produce. It needs to be said again and again- power matters. There is also no guarantee that increased education will lead to more jobs, as our economy has clearly not shown that tendency in the last several decade. If the bottom 90% of Americans have no say over how surplus is distributed, they will continue to get less than their productive share as the incomes of the very top fly away. This issue holds for the uneducated, high school educated, and college educated- however, the college educated are relatively productive enough that they end up earning plenty to get by (although this could become less true). Thus, we realize that as Mishels says, the wage gap and jobs gap do not come from a skills gap but a class gap and a power gap. Unemployment and stagnant wages are structural, but not in the sense that conservative neoclassical economics define it. They are a result of the capitalist power dynamics and employer relations in our society. Fiscal stimulus and education are both admirable goals, but we need radical changes to restore our economy’s long-term ability to create quality jobs. Mishels doesn’t drive at the solutions to these problems, but I’m really glad he helps dispel some important mainstream economic myths. I want to continue our string of postings on education (here and here) with a discussion on rankings. Rankings are both alluring and dangerous in their simplicity. For U.S. higher education, U.S. News & World Report publishes rankings as a guide for prospective students. And because universities need to attract students, they pursue a higher ranking, sometimes recklessly. At Notre Dame, the reckless and thoughtless pursuit of a higher ranking eliminated pluralism from the economics department. Pursuit of ranking also leads to some bizarre occurrences, such as strictly enforcing 49 person class sizes (to score higher in the “classes under 50” category) and strange accounting measures on who is an alumni (to score higher for “% of alumni who donate”), among others. Unlike U.S. News and World Report and similar guides, this one asks not what colleges can do for you, but what colleges are doing for the country. Are they educating low-income students, or just catering to the affluent? Are they improving the quality of their teaching, or ducking accountability for it? 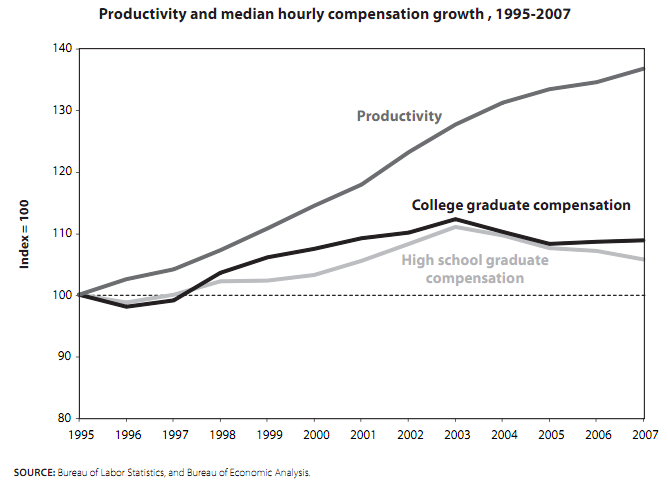 Are they trying to become more productive—and if so, why is average tuition rising faster than health care costs? Every year we lavish billions of tax dollars and other public benefits on institutions of higher learning. This guide asks: Are we getting the most for our money? You can read the methodology on how they set out to achieve such a ranking, but it basically involves compiling a Community Service Score (which includes how many students do ROTC and Peace Corps, and what % of federal work-study grants go to community service projects) a Research Score ($ spent on research and PhD’s awarded) and a Social Mobility Score (which compares the proportion of students with Pell Grants and overall graduation rates). You can see their rankings here. The University of Notre Dame actually improves slightly (from #20 in US News) to #19. Princeton drops (from #1 in US News) to #28th. Check it out. See, rankings are alluring, aren’t they? The salary can be lowest for the lowest grades and increase stepwise through post graduate. It might vary according to average local salaries, with the student’s home being the determinant. For high school and above, the salary should be above the single person’s poverty guideline for each geographic area. Of course, the proposal’s success relies on students responding to this incentive by investing more time and effort in their education. This leap should be easy for most economists, although I’m sure there are some behavioral economists who might cite perverse incentives, capture of money by parents, and others. At the margins, though, it’s likely that salaries would reduce dropout rates and increase post-secondary completion rates. Depending on how high the uptake is, this proposal could be high bang-for-buck as far as education policies go. From a political standpoint, one would think Mitchell’s idea would be better received in terms of the education/investment benefits, and less well-received on the stimulus/deficit aspects of it. Of course, in our current conjecture, it’s almost guaranteed that the latter would receive far more attention. Convincing deficit hawks to invest in anything with government funds seems like a lost cause these days. Mitchell’s proposal to leave implementation up to the states probably makes it more palatable, but also more susceptible to manipulation by conservative state administrations. Given the apparently stagnant recovery, these would be well-spent stimulus dollars that would address the key problem making our economy less dynamic- too little education. I might amend the proposal to have a parent income phase-out, as less incentive is needed for these students, and I would argue those dollars are less stimulative. At the same time, making this inclusive also makes it seem customary and less divisive.